OnePlus has launched its Mclaren edition with 10GB RAM and Qualcomm Snapdragon 845 processor, which makes this smartphone pretty much fast. We are comparing the device with the Apple’s iPhone XS Max too see which one is better in terms of specifications? The OnePlus has collaborated with the popular car manufacturer Mclaren for the very first time. The OnePlus Mclaren edition carries the signature design of the Mclaren company. The phone has been launched with 10GB RAM and Qualcomm Snapdragon 845 processor that should definitely make this smartphone smooth in terms of performance. On the other hand, the iPhone XS Max, which is the most expensive smartphone by Apple till the date has been launched with a bigger display but comes with the same design as iPhone X. So, let’s do a quick specifications comparison too see which device is the best when it comes to hardware? Let’s begin with comparing the display of these two smartphones in detail. The OnePlus 6T Mclaren Edition features the same 6.4-inch display as the OnePlus 6T. The device offers a resolution of 2340 x 1080 pixels. On the other hand, the iPhone XS Max sports a bigger 6.5-inch display, which offers a resolution of 1242 x 2688 pixels. When it comes to the performance, the OnePlus 6T Mclaren Edition is powered by the Qualcomm Snapdragon 845 processor, which is coupled with 10GB RAM and 128GB internal memory. On the other hand, the iPhone XS Max is backed by the Apple A12 Bionic chipset, which is paired with 4GB RAM and 64GB internal memory. The iPhone XS Max is also available in two other storage models- 4GB/256GB and 4GB/512GB. 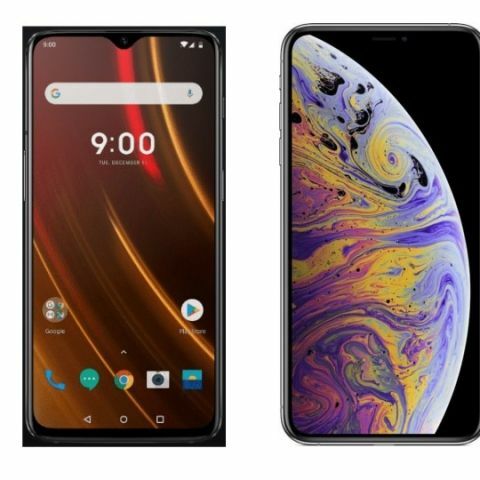 OnePlus 6T vs OnePlus 6T Mclaren edition: What’s the difference? As far as the cameras are concerned, both the devices have a dual camera setup the back. The OnePlus 6T Mclaren Edition comes with a dual 16MP + 20MP rear camera, while the iPhone XS Max features a dual 12MP sensors at the back. At the front, the OnePlus 6T Mclaren Edition has a 16MP unit, while the iPhone XS Max sports a 7MP Sensor. The OnePlus 6T Mclaren Edition bottom edges are covered by an orange color band, which makes this smartphone stylish in terms of design compared to OnePlus 6T and iPhone XS Max. The phone comes with 10GB RAM and 256GB internal memory that is not expandable. The company has also provided Warp charge 30 in the box, which as per the company, can provide a full day battery in just 20 mins. 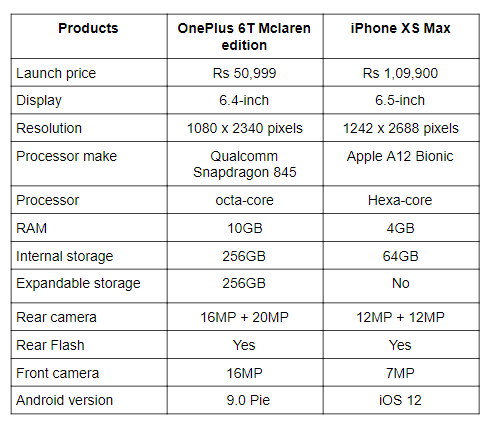 The OnePlus 6T Mclaren Edition is priced at Rs 50,9999 in India, while you can get the new iPhone XS Max for 1.04,900.
iPhone SE 64 GB for 25k vs OnePlus 3T 64 GB, what should I buy?